Posted November 30, 2012 in Uncategorized. 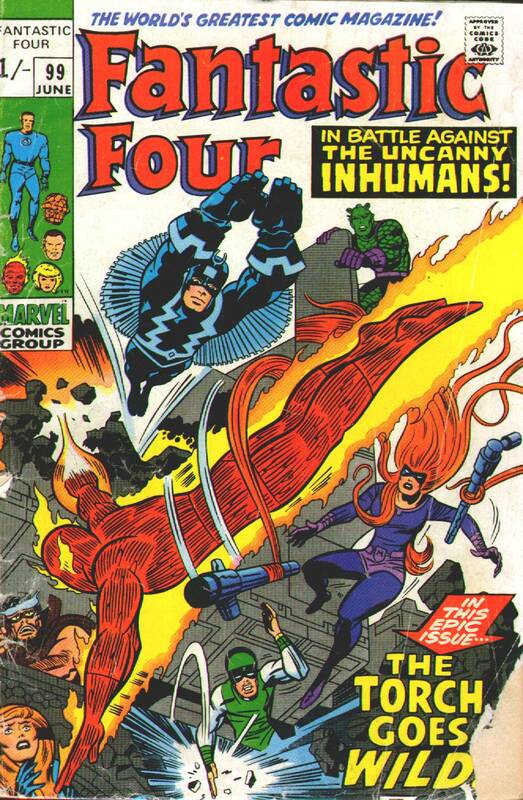 A couple readers mentioned they would enjoy seeing the 70s Kirby/Sinnott FF covers, so your wish is my command — I’ll run those over the next few days. I know I really loved these as a kid. 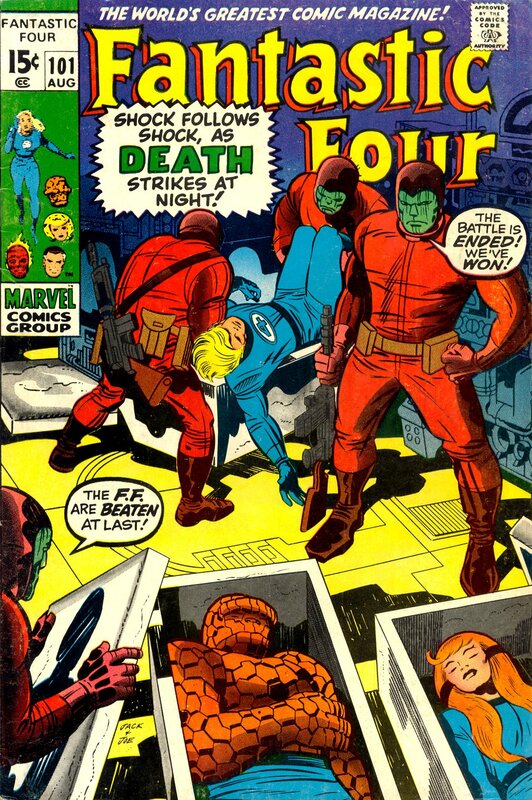 As far as I know this is the first FF cover Jack and Joe did together when Jack returned to Marvel. 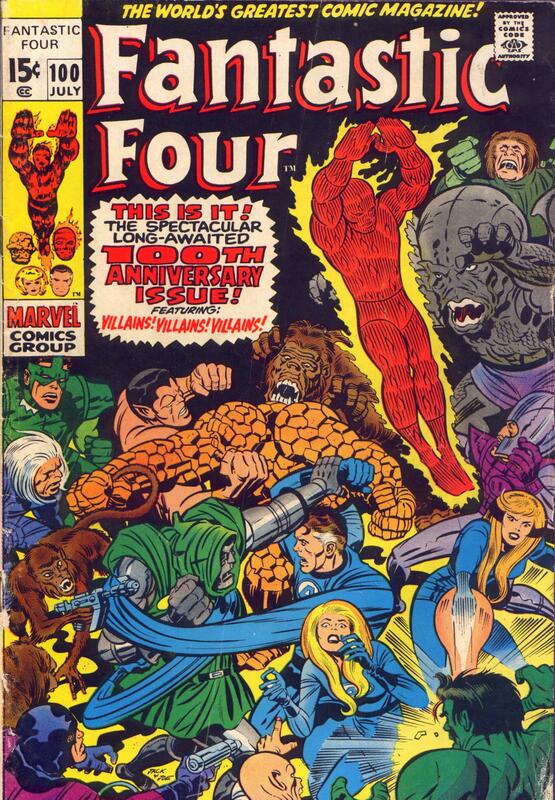 Fantastic Four # 164 (Nov 1975). 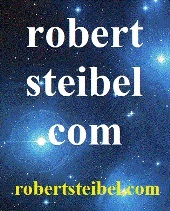 Below that is a scan of the cover from the Philippines edition. Posted November 29, 2012 in Uncategorized. 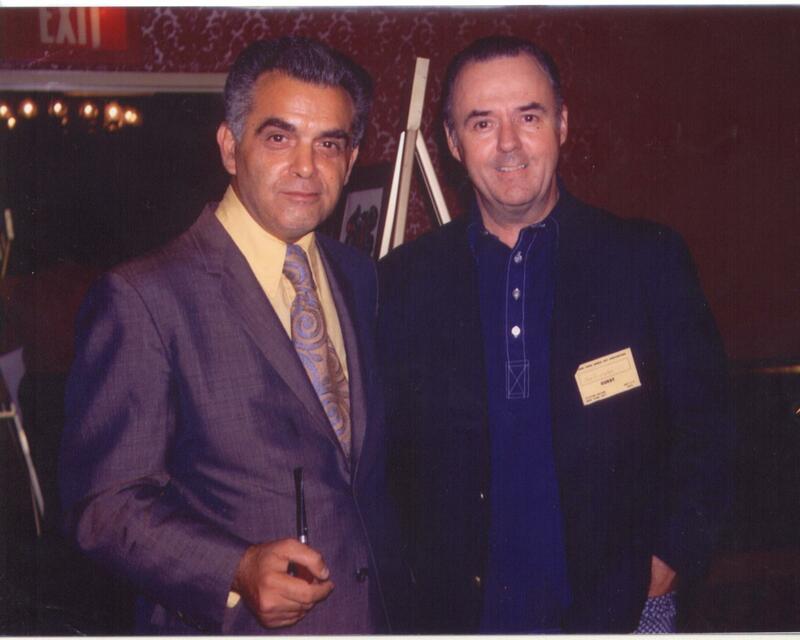 Here’s a photo Joe Sinnott’s son Mark sent me a few years ago of Jack and Joe together at a convention in the 1970s. Joe was even nice enough to sign it on the back. 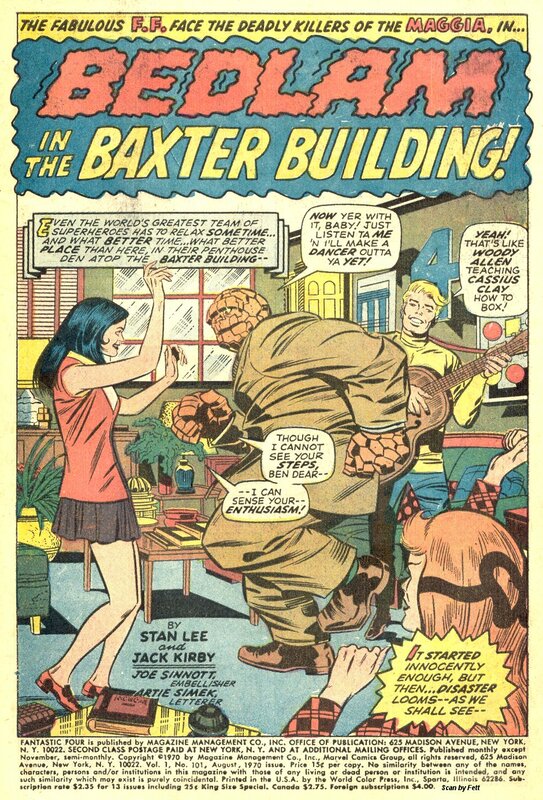 I hope you all enjoyed the little Kirby/Sinnott FF retrospective. 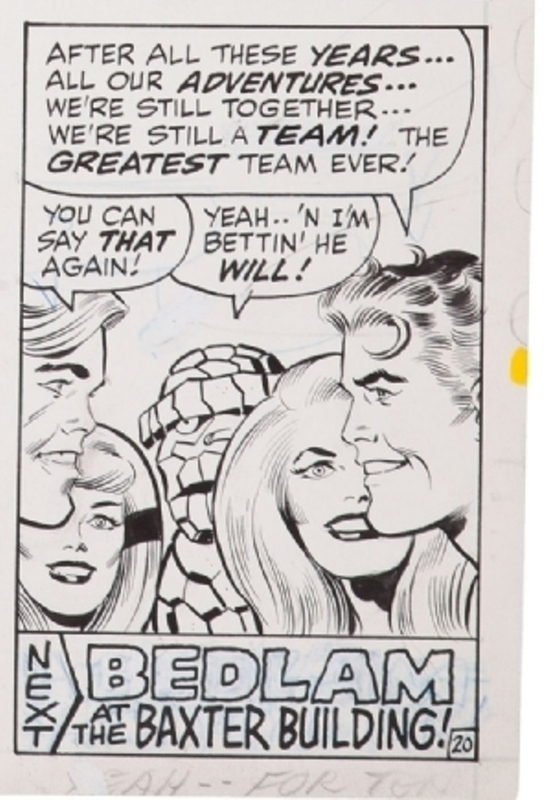 It was an honor to present it and a lot of fun to look at all of those wonderful Kirby/Sinnott stories again. 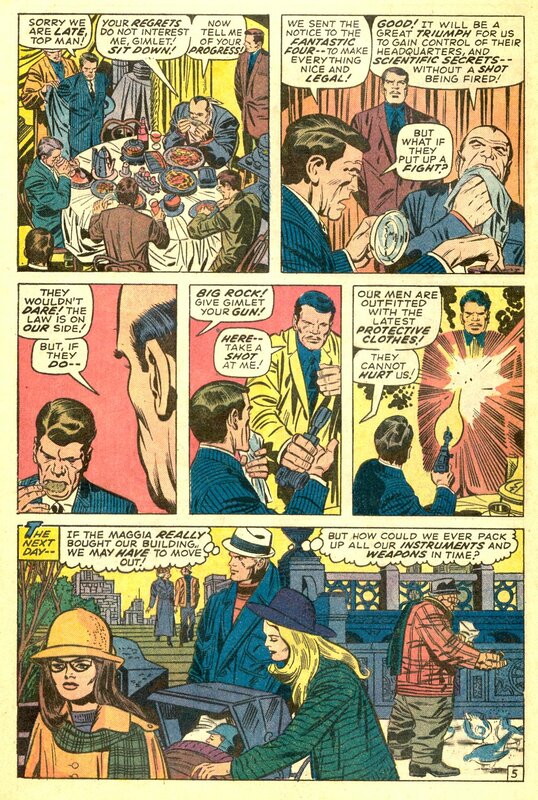 In my opinion Jack and Joe are the Lennon/McCartney of comics art. Posted November 28, 2012 in Uncategorized. 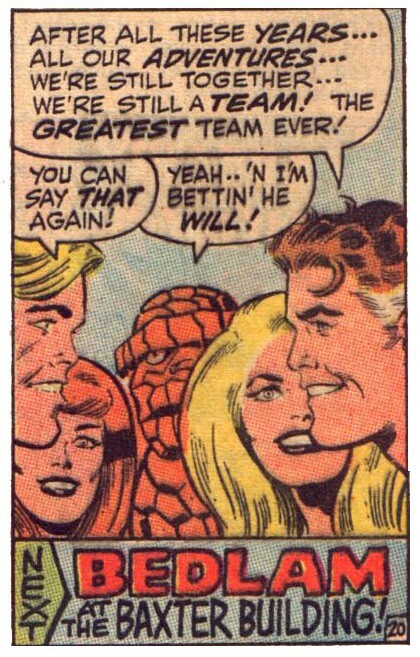 Thus endeth the Kirby/Sinnott FF run. 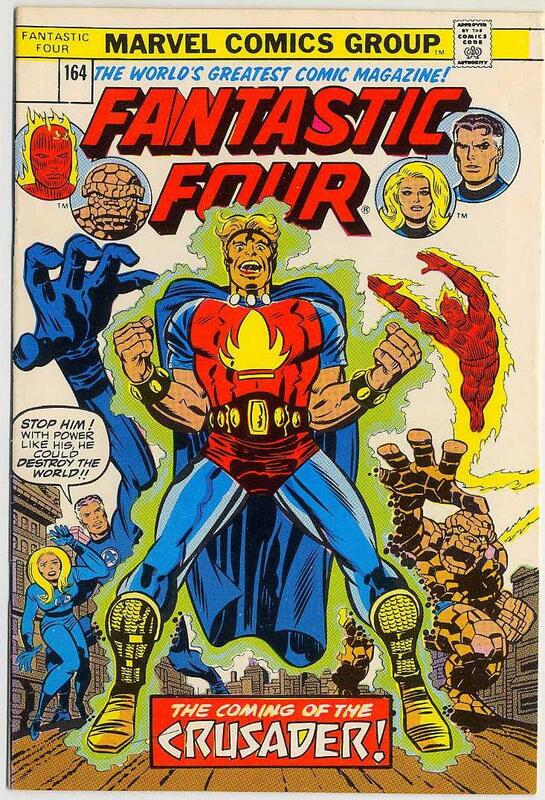 Jack and Joe still did some covers together in the 70s featuring FF, and of course the famous Sulver Surfer graphic novel, but this really marks the offical end of their FF run. 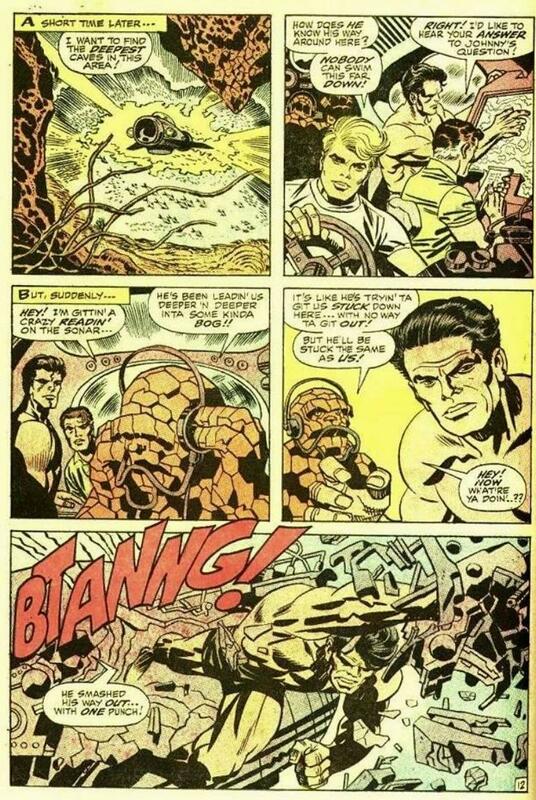 I guess I could show you a few pages from the FF # 108 hatchet job Stan Lee turned in, but clearly that mess was an insult to everyone involved, especially the fans. 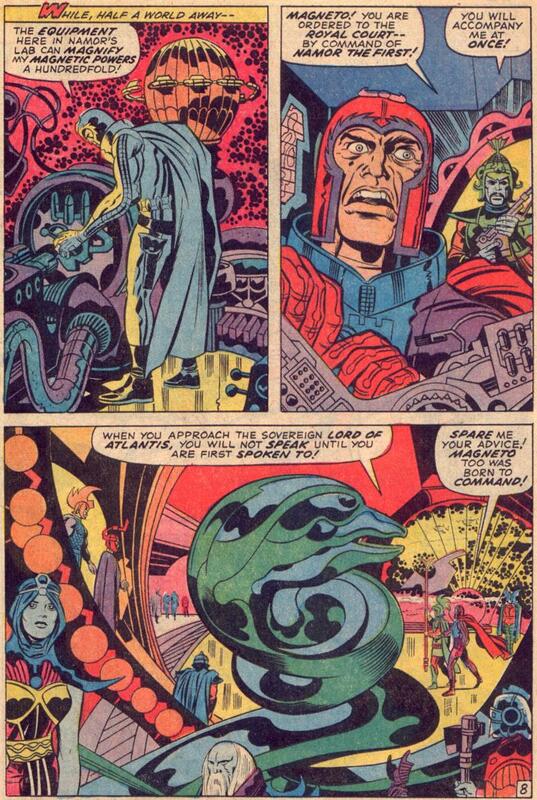 So lets end on a high point, 4 pages from the last Kirby/Sinnott FF book. 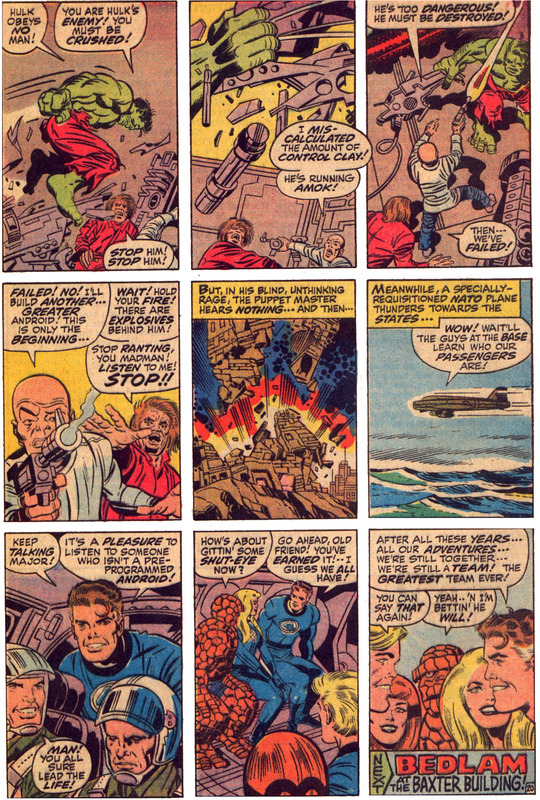 I love that Jack’s epic FF saga ends on a cliffhanger. Posted November 27, 2012 in Uncategorized. 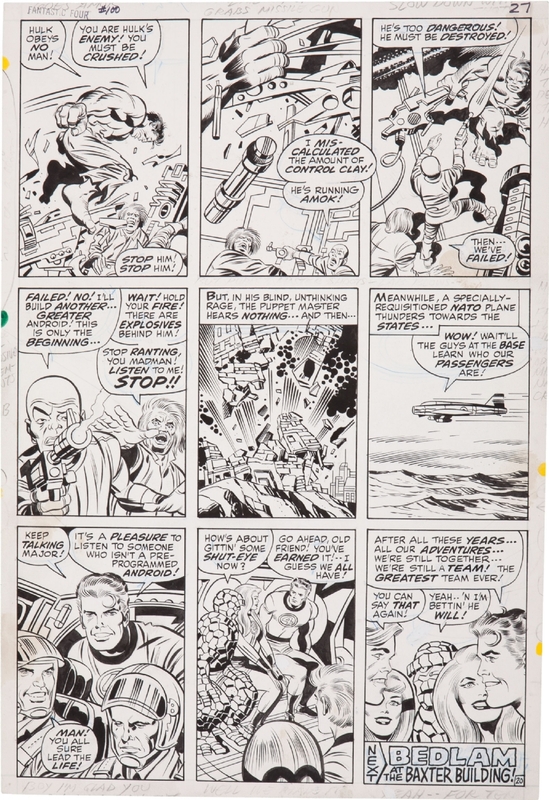 Before I sold my Kirby art collection, I made scans of all the pages. 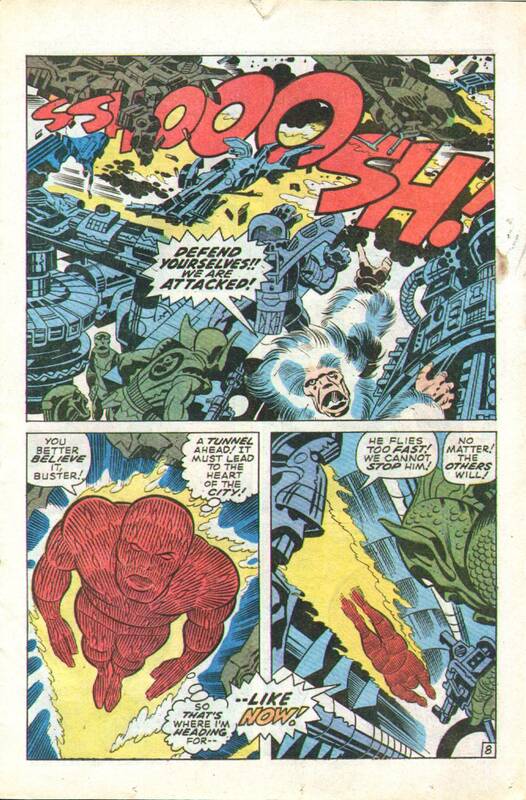 Here is one from FF # 101, page 5. I love the final panel. Jack’s note to Stan Lee says “Meanwhile FF grab some fresh air.” Wonderful image of the FF family living a normal life in between adventures. Let’s take a closer look at it. Nice touch having the couple holding hands in the background. Notice Joe inks every brick in the buildings, hints at leaves on the trees, and makes sure to ink every tree branch. 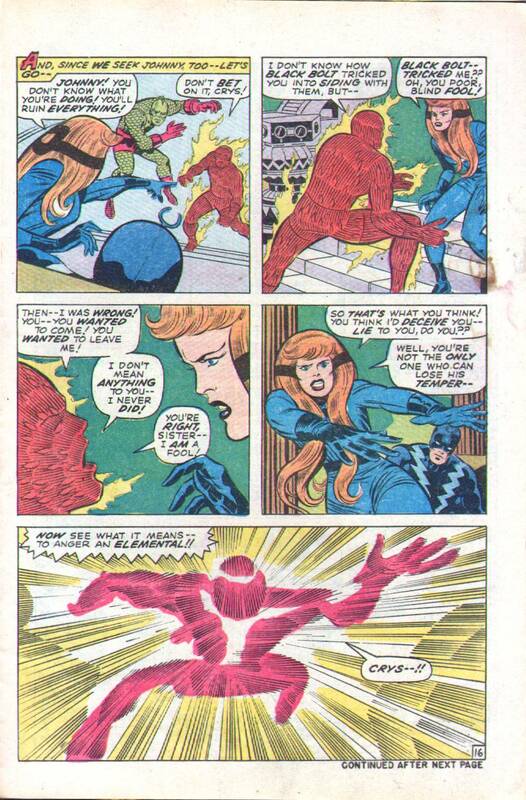 I think the chances were 0/100 that Vince Colletta would have delineated details like that. There are partial margins on the left side pointing to the female pedestrian’s face. 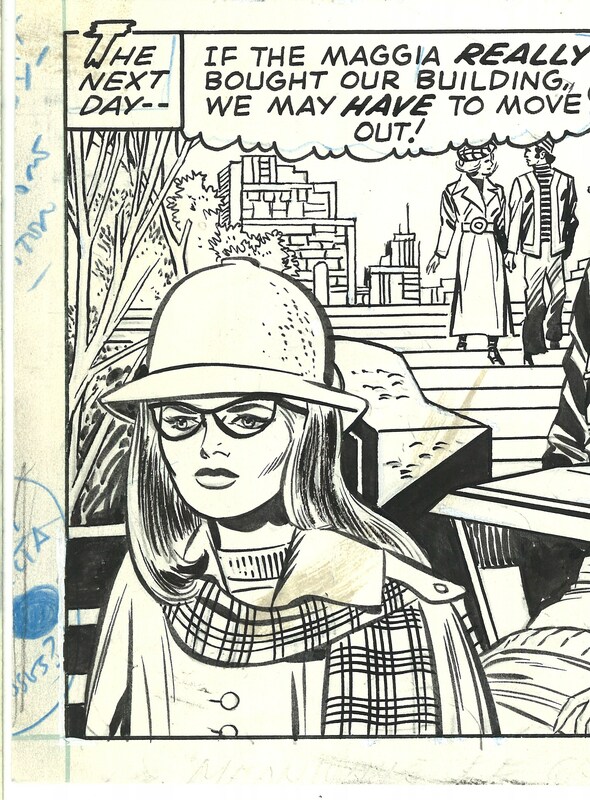 It looks like Lee might have had Romita add some Spidey shades to the girl… maybe so the True Believers wouldn’t think she was Crystal? 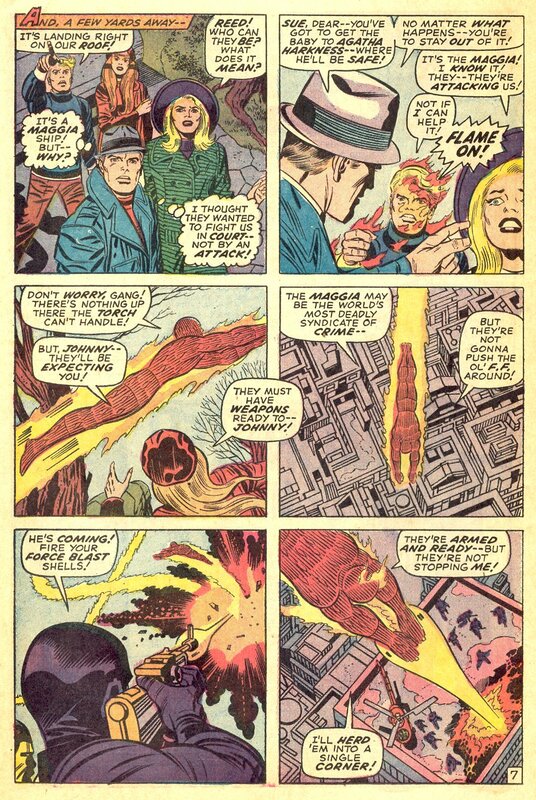 Or who knows, you’d think by this time in their careers Kirby/Sinnott knew what they were doing so these sorts of changes would be unnecessary. 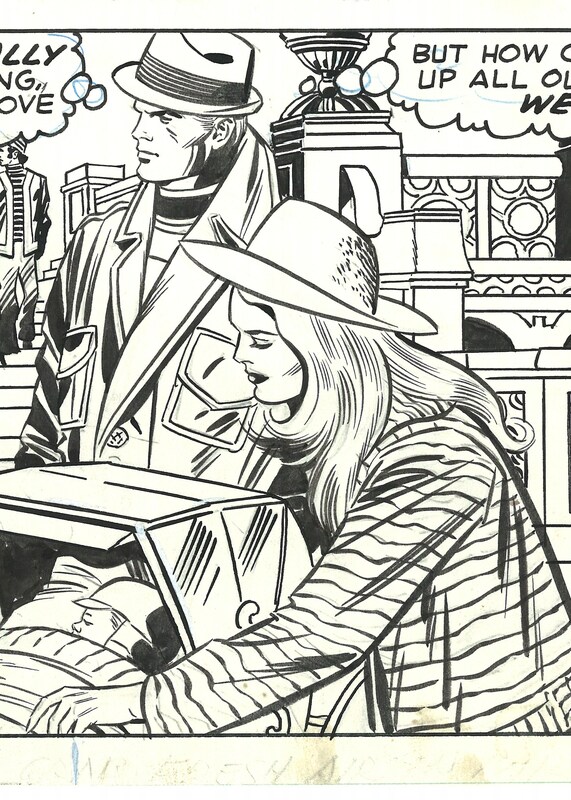 Great image of Reed and Sue — husband and wife out in the city with their baby. 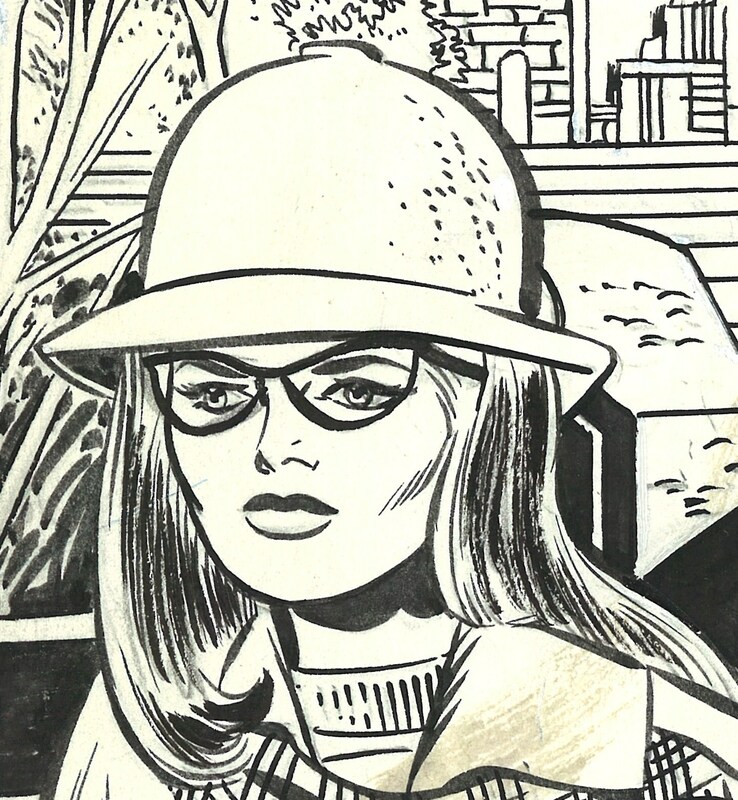 Beautiful attention to detail and line variety on Sue, especially her coat. It looked like Joe used the tip of a needle to ink the baby’s face. 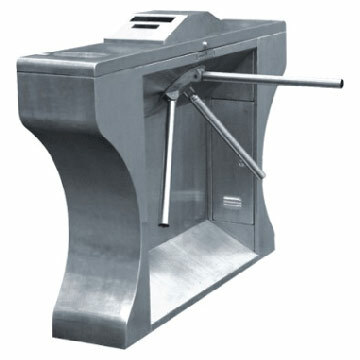 Great comedic image of the bulky Thing feeding the pigeons. 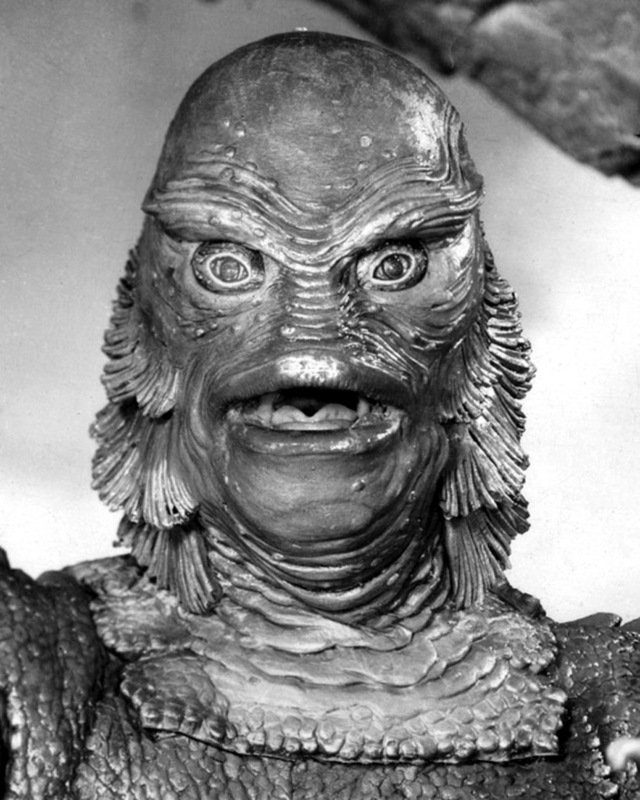 The monster with a heart of gold. 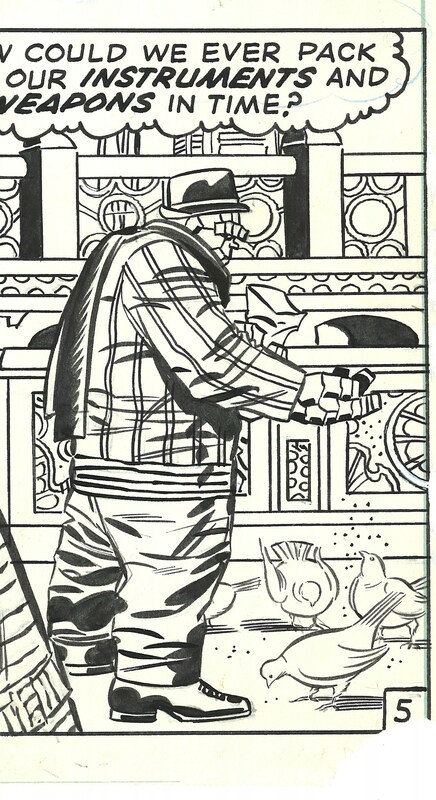 I would argue Joe Sinnott does a better inking job just on those tiny pigeons than most artists working in comics in the 1960s could achieve, and Joe’s craftsmanship remains superior to many artists inking comics today. 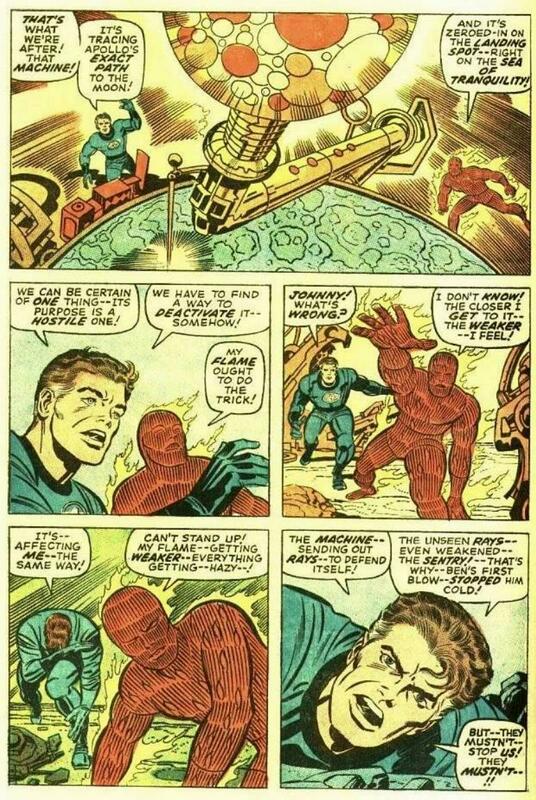 This is simply one panel out of the 1000s that Jack and Joe produced, and as you can see, all the details Jack put in the art in the pencil phase and Joe’s unselfishness in terms of putting in the extra time to embellish every single one of those details to perfection are the main reasons why for many the Kirby/Sinnott FF artwork set the gold standard in comics art history. Posted November 26, 2012 in Uncategorized. 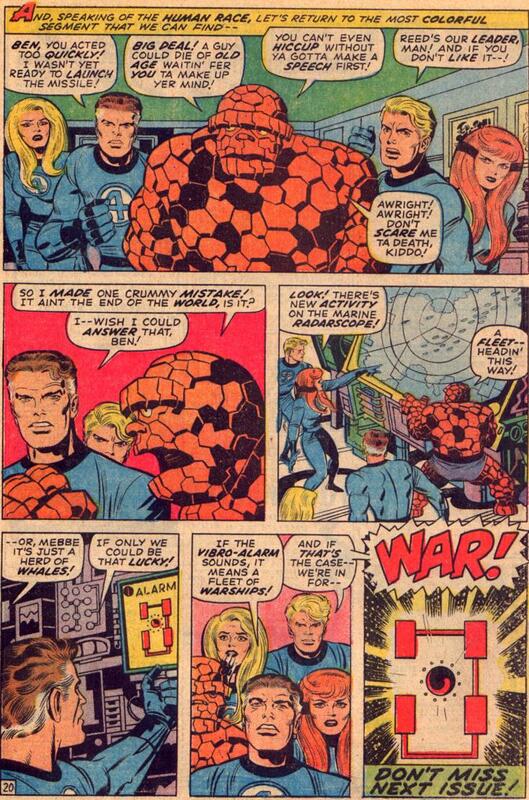 After the 10 year Kirby run on FF, we get two more bonus issues: FF # 101 and 102. 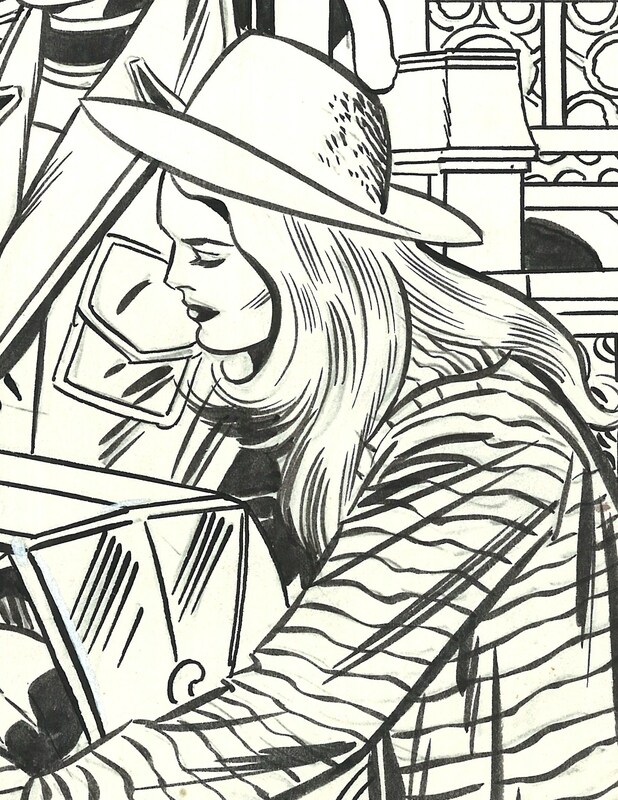 Here’s some art from issue 101. I love the humor on the splash page. Jack brought so much personality and fun to this series, elements that would be almost completely gone after he left the title. 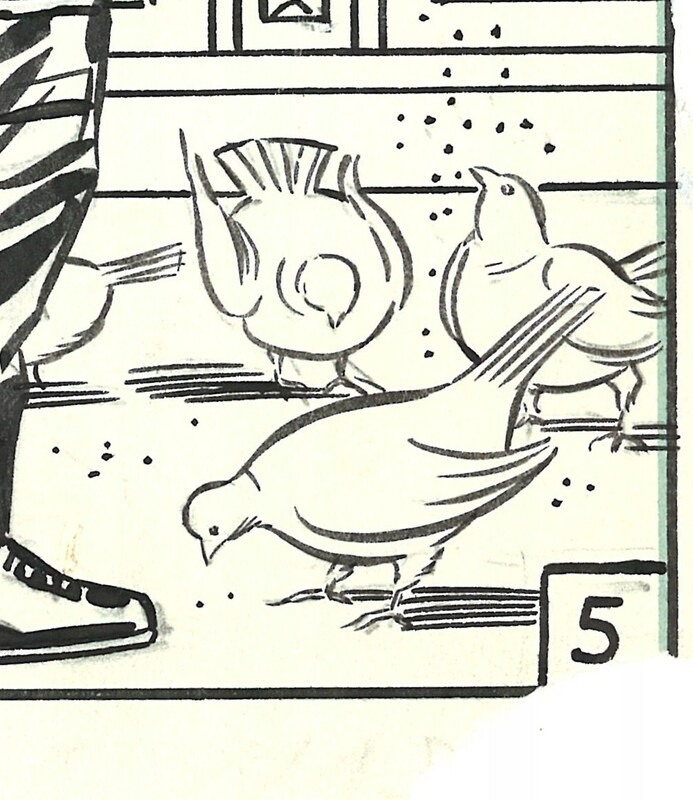 I used to own the original art for page 5 — I enjoy all the little details in the art like the Thing feeding the pigeons. 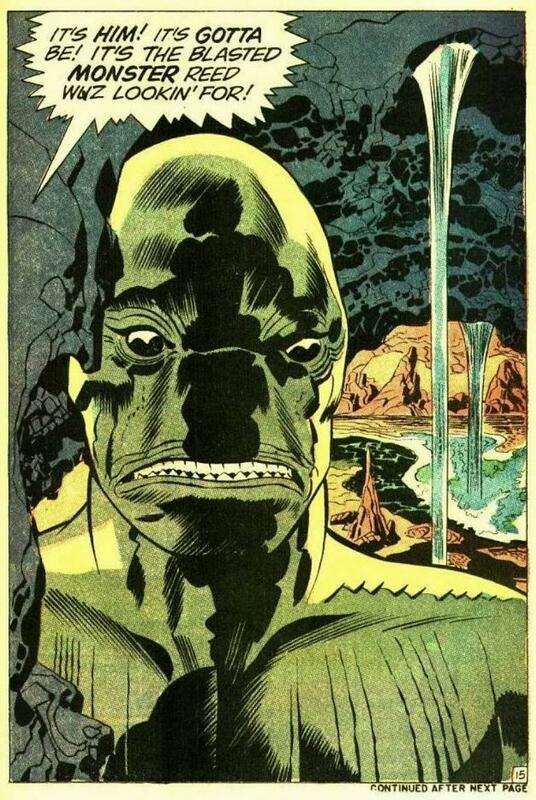 The murky coloring obscures the fact Joe inked every little detail to perfection. 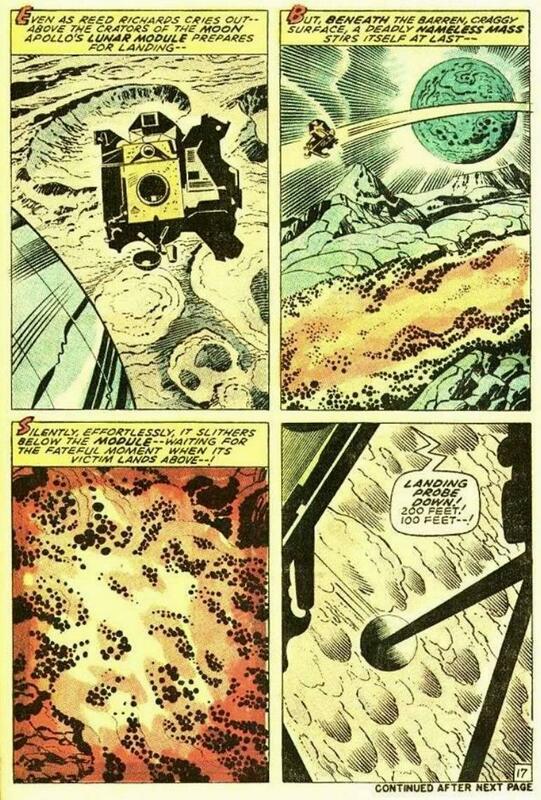 Page 7 is another great example of Kirby as director, starting with that bird’s-eye view, then he cuts to the action in the sky. 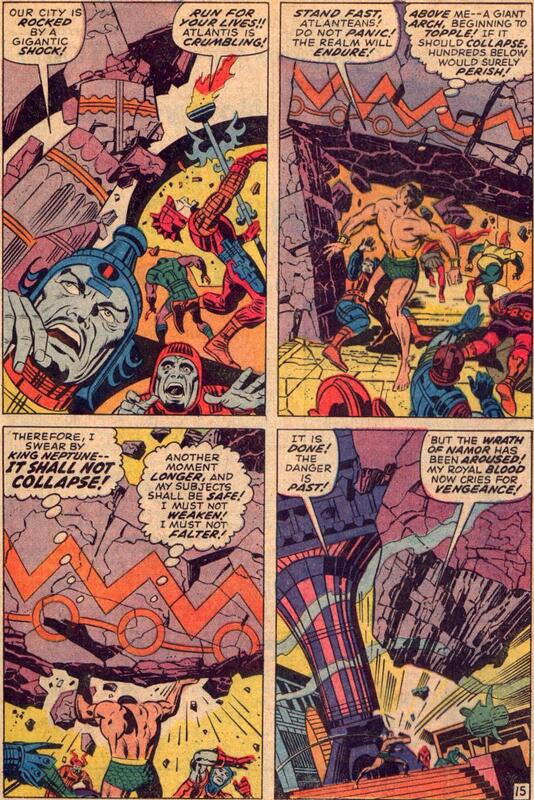 The book is another solid Kirby/Sinnott comics masterpiece. 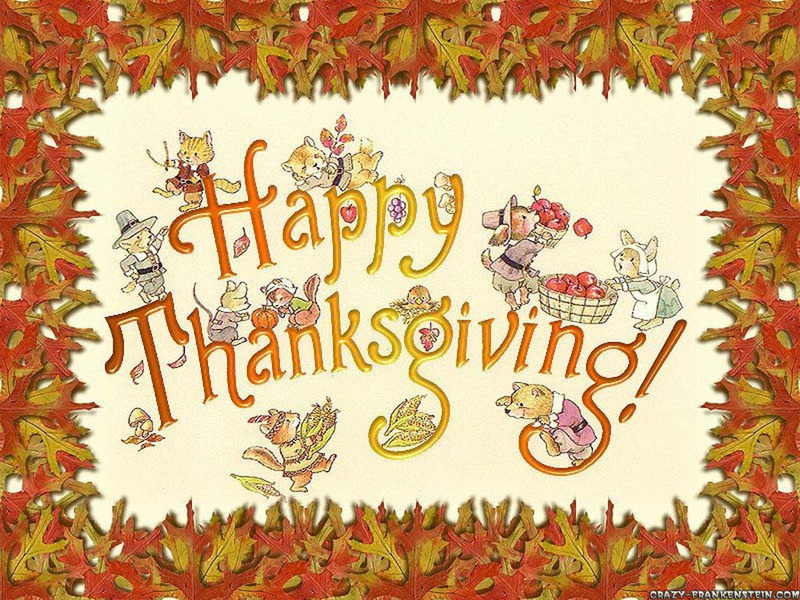 Posted November 25, 2012 in Uncategorized. 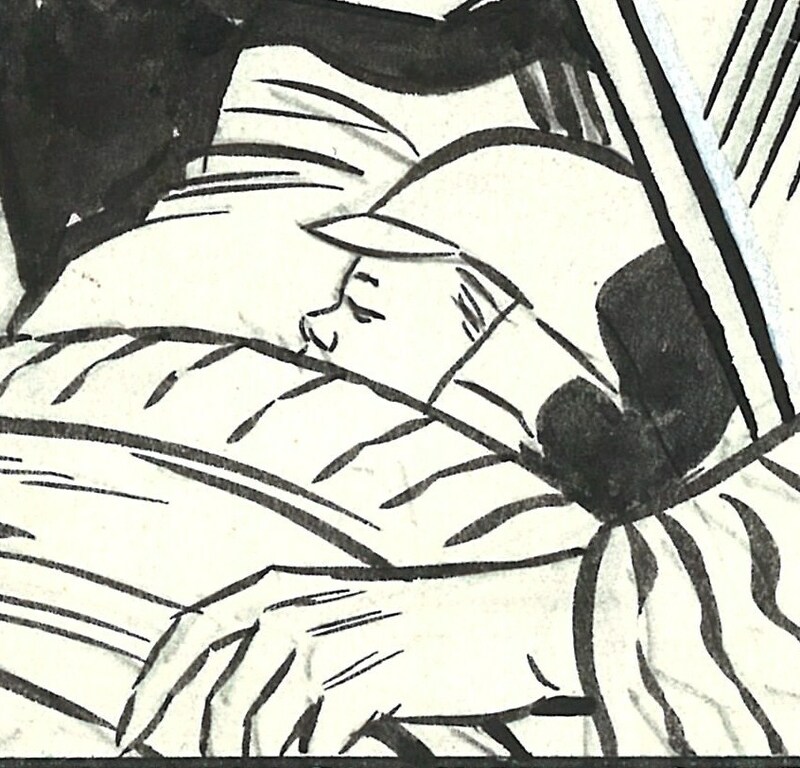 Final panel from FF # 100. The fragment of Jack’s margin note says “Yeah — for ten…” Probably Jack having one of the characters commenting on the fact that this marks the anniversary of the FF’s 10-year run. 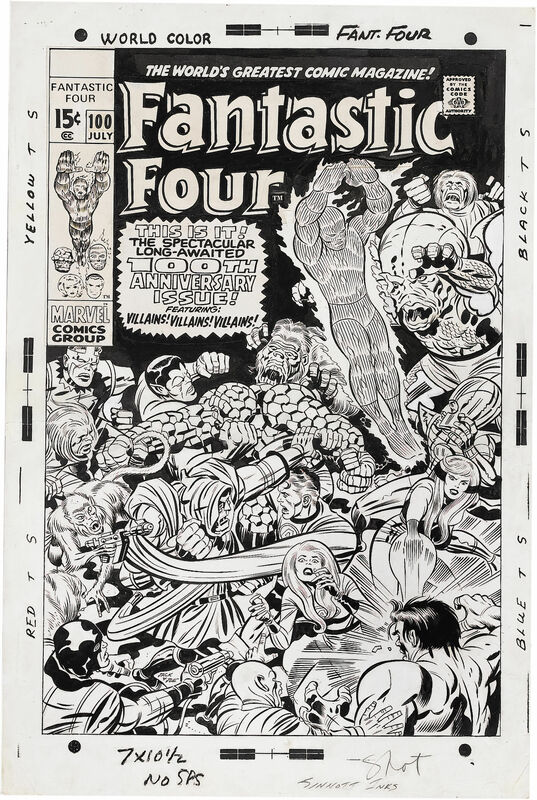 Spectacular cover — maybe one of the most iconic of all time — signed under Doc Doom’s foot: “Jack and Joe.” Here’s a scan of the original art. 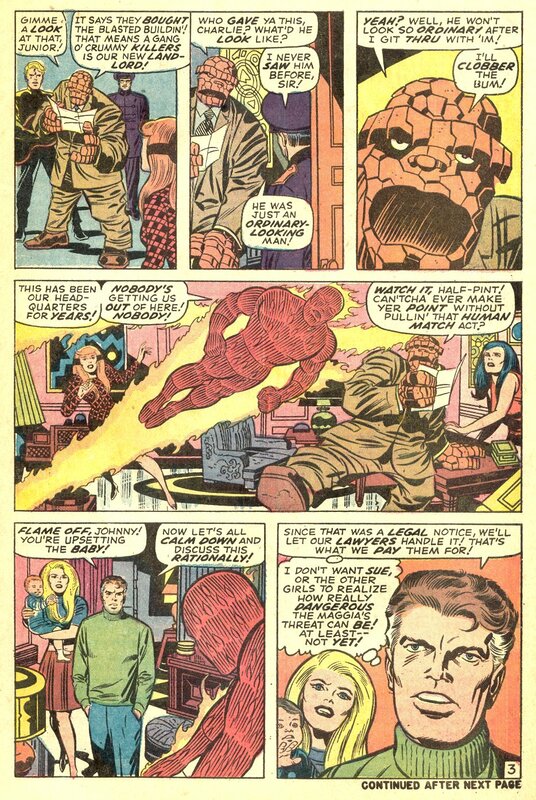 Another example of Kirby/Sinnott clearly at the top of their game although their collaboration on FF was nearing it’s conclusion. The book itself looks thrown together. 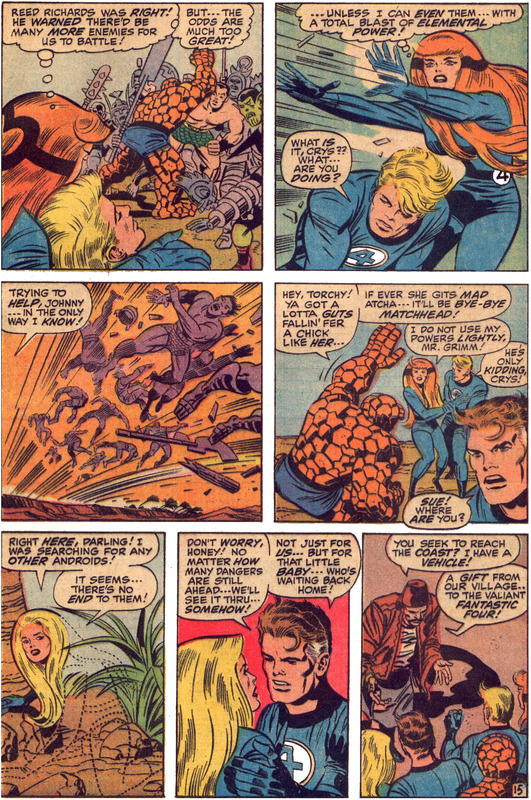 I recall reading somewhere the original intention for FF # 100 was to make this issue a double-sized issue, so although I’m not sure why Lee abandoned the idea, this probably explains why Jack has several pages in the story with 9 panels — he’s trying to pack his original 40-page epic into 20 pages. These scans look like they came from the MGC reprint since there is a loss of quality in the artwork. 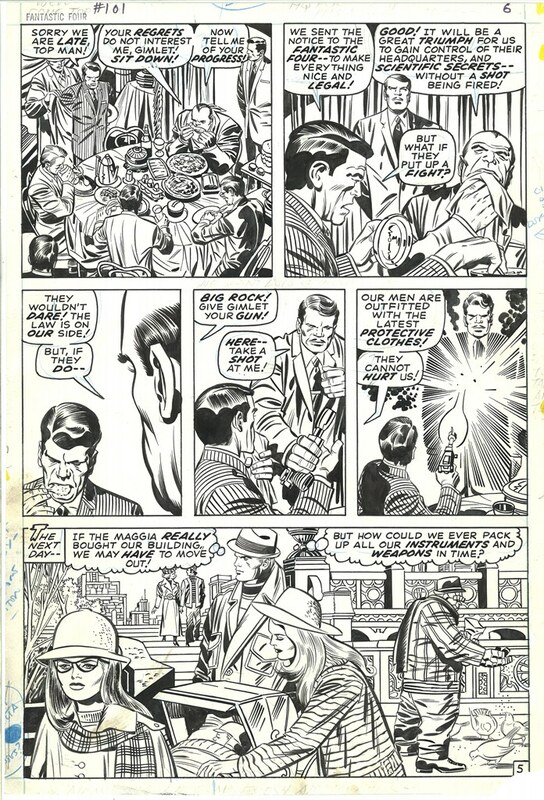 I included a scan of the original artwork for the final page as well; as usual, you can see traces of Jack’s penciled margin notes in the borders — that constant reminder on just about every page of Kirby original artwork telling us who was really writing these stories. Pretty amazing milestone for a comics creator/artist to work on one book for 100 issues. 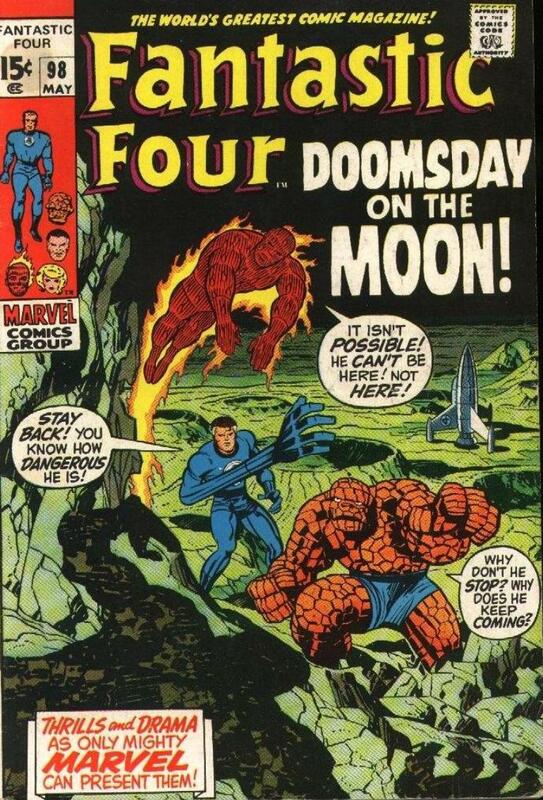 No doubt in my mind that if Goodman and Lee had given Jack a fair deal, Jack could have continued to crank out great FF stories and art for another decade. Crystal especially was a character with tremendous potential in Jack’s hands. 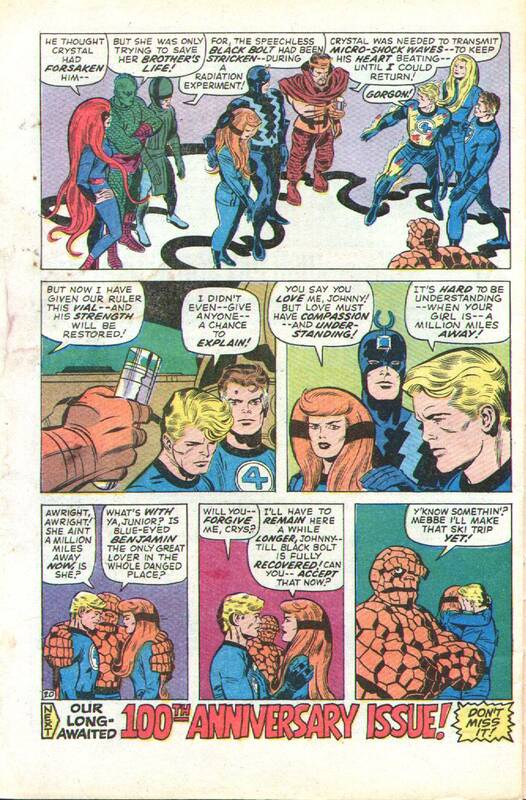 That final panel really shows the sense of family Jack brought to his FF concept, something that I remember being totally lost after Jack left the book as we witnessed a parade of lame replacement characters coming in and out of the team like the FF family was a turnstile. 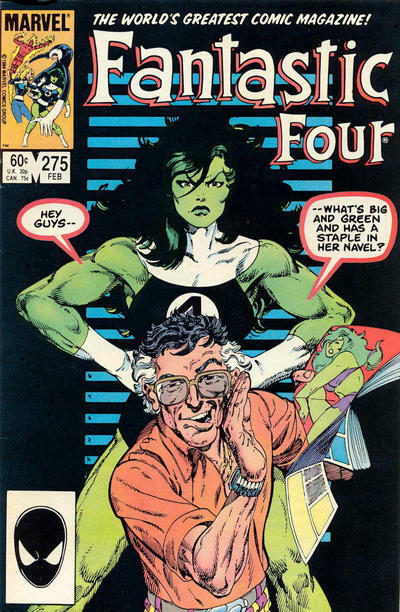 If I recall correctly, when I stopped buying comics in the 80s John Byrne had the absurd She Hulk character in the comic replacing somebody, and in the storyline the blind Alicia was cheating on Ben Grimm, banging his best friend the Human Torch. This is one of the last comics I ever bought, I never even read it, I was in college and had completely grown out of my comics phase (until I rediscovered Jack’s work in 2000). That shyster character looks a lot like Stan Lee. There’s the idiotic black Spider-man face in the bottom-left UPC box. 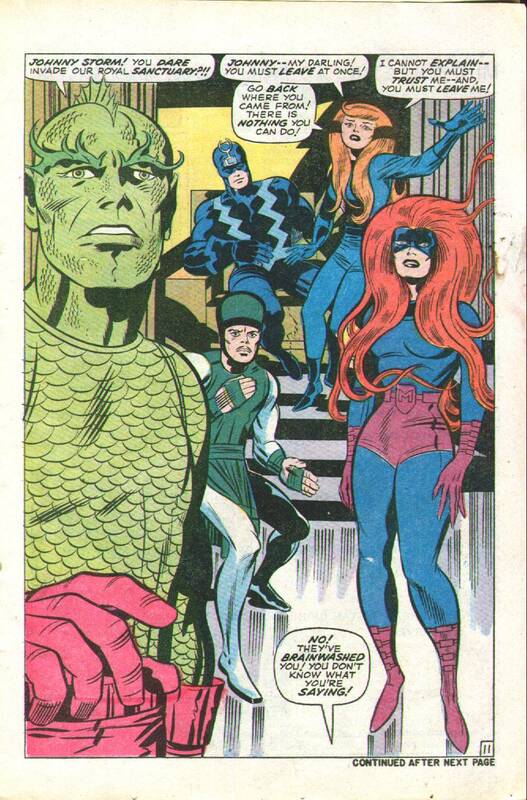 Many have suggested Marvel redesigned a lot of their characters around this time in order to prevent any possible lawsuits from the Kirbys where Jack could argue designing the iconic costumes of the pivotal 60s Marvel characters was an important part of the creative process. 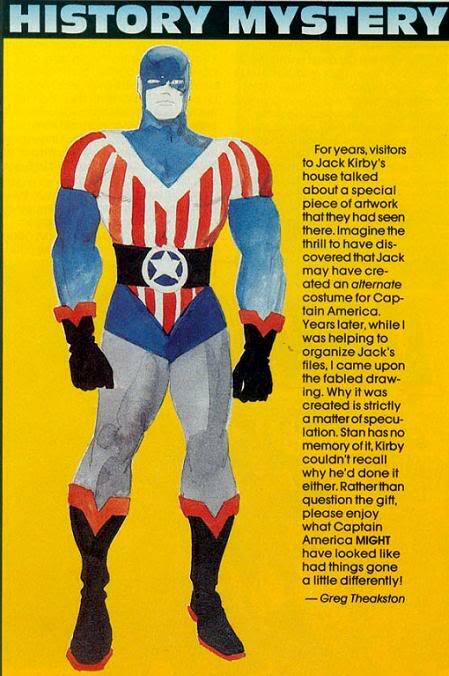 Not unlikely, ironically Jack himself worked on a redesign of Captain America, probably a move that was considered to avoid any potential lawsuits from Joe Simon in the 1960s. 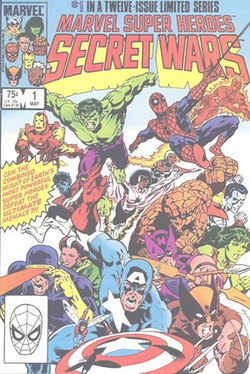 I think Marvel was doing that “Secret Wars” rip-off around this time in the 80s where they were trying to make you buy a bunch of other books if you wanted to figure out what in the hell was going on in the storyline of your favorite book — that was another reason I stopped buying comics, as a loyal reader of a comic like FF I felt like I was being scammed; I personally thought all the Secret Wars stuff was garbage and was offended by Marvel trying to shove that crap down my throat. But I recall hearing that concept was financially successful so I assume Marvel is probably still doing “Civil War” concepts where the few suckers who still buy their over-priced junk have to spend hundreds of bucks just to read a complete story. 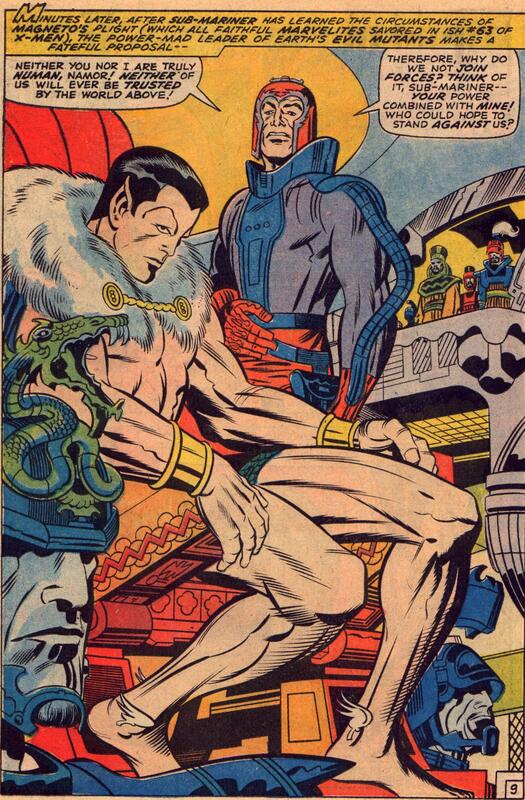 Man, everybody always looks so bloody and angry in these new Marvel comics. 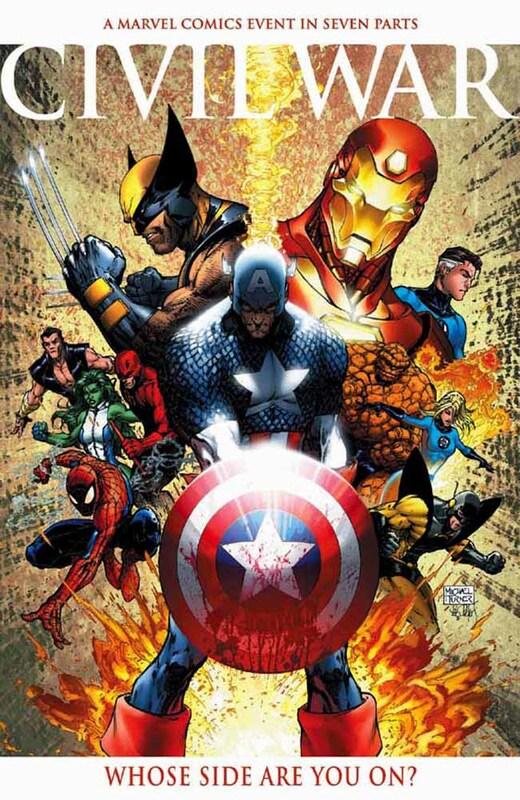 I never read the Marvel “Civil War,” but I hope all of Jack’s characters killed each other off in that series and Marvel brought in some new talent to create some new characters. 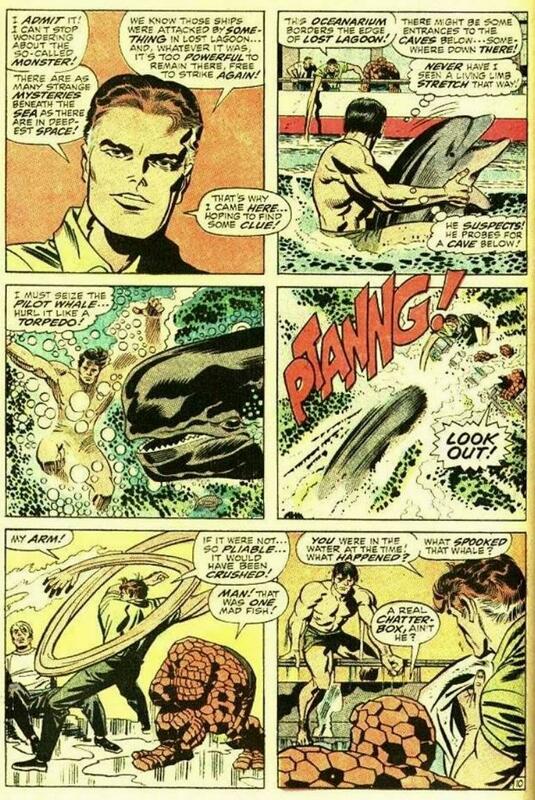 I’m not one of these continuity freaks (I really could care less what new creators do with other peoples creations) but it was amazing to me — despite the fact that as a teenager I really liked his artwork (it doesn’t resonate with me as an adult) — how soulless Byrne’s run on the series in the 80s was; the only thing that really gave that run any power was the fact that so much of Byrne’s artwork was clearly Kirby homage. 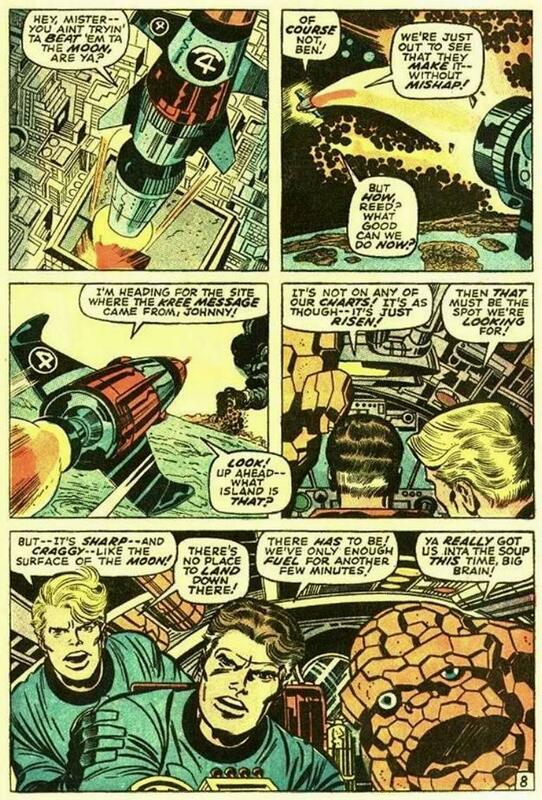 Someone told me before that Marvel’s attitude was: if you can’t have the real Kirby onboard, you might as well hire his best clones. 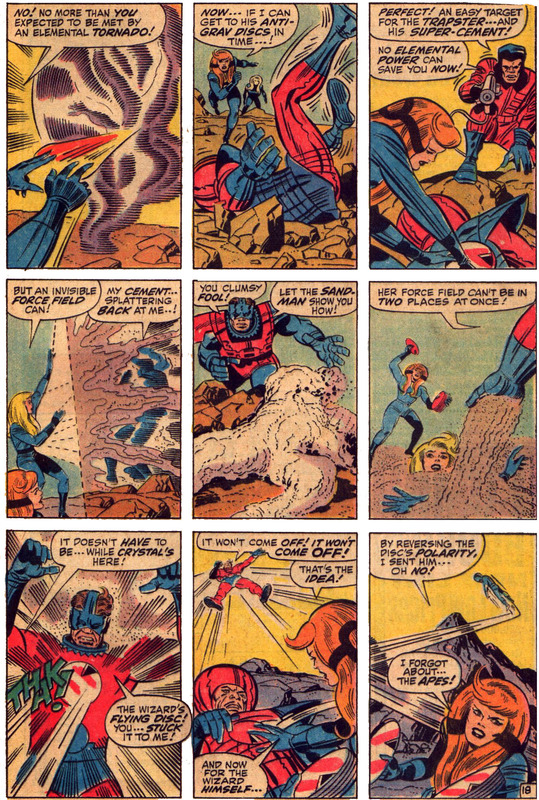 Well, here’s a few final FF pages from the real Kirby’s FF run. 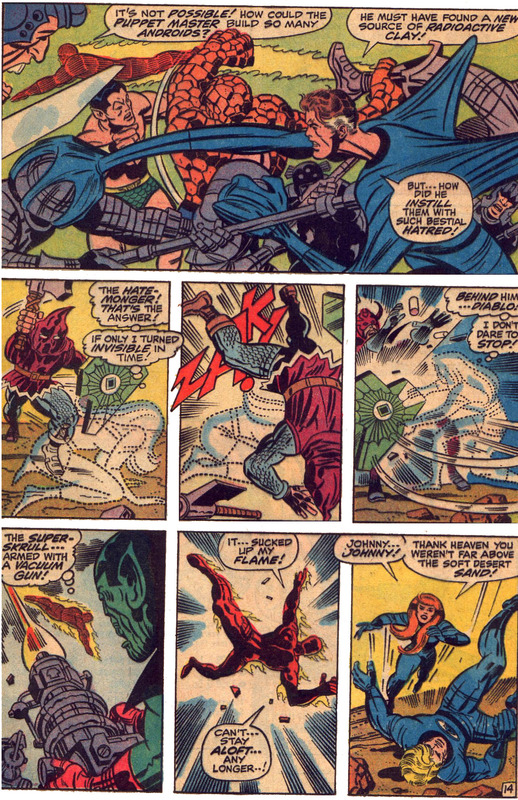 Even packed into those tiny panels because of Lee meddling with his story, Jack’s dynamics still blow away those of any artist working in comics in the 1960s, and today. Posted November 24, 2012 in Uncategorized. A workmanlike performance from Jack and Joe here. I don’t think Jack’s heart is in this series any longer at this point, but there is still a lot of great artwork throughout this book, and Johnny and Crystal reuniting pretty much wraps up the last thread in Jack’s 10-year FF epic. 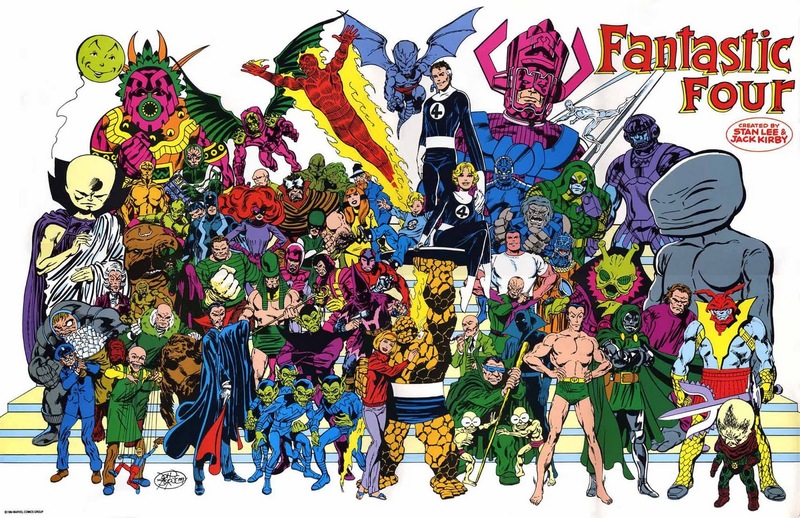 Anti-climactic, but still part of an historic and classic series — unquestionably Jack’s whole FF run has to be considered one of the most important, popular, and memorable comics series of all time. Loved reading this reprint as an 11-year-old in 1978. 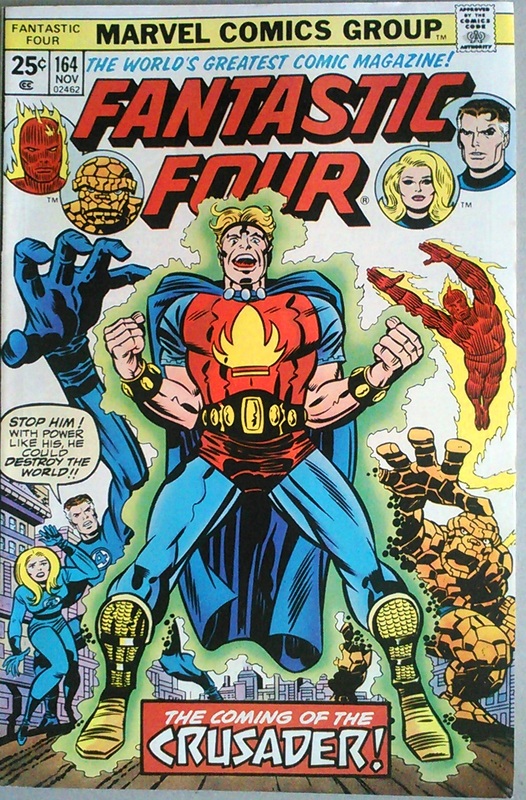 Funny that just as I was discovering Jack, the reprints of his FF run were wrapping-up (although they’d be reprinted a zillion more times) and Jack’s tenure at Marvel was also ending. Right when I started buying comics, Jack was moving on to animation and I was witnessing the end of an era. 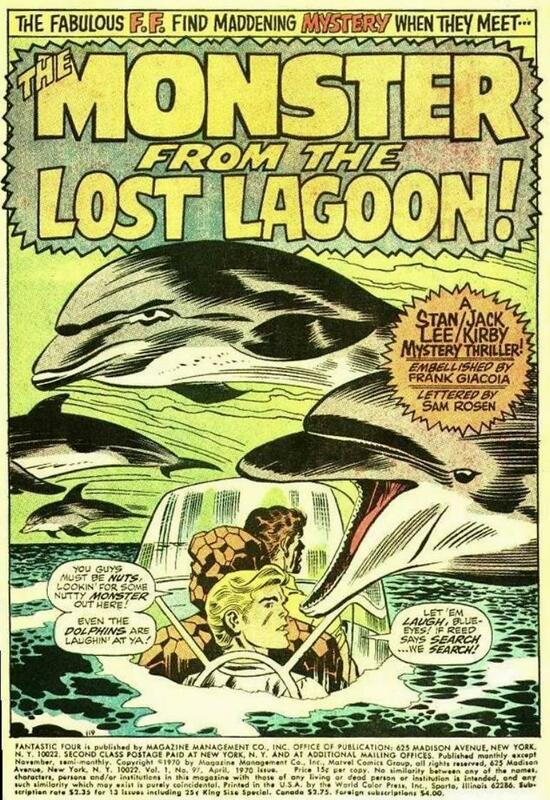 I feel really fortunate to have been a comics fan when Jack was still working in the business. I personally don’t think it’ll ever be the same. 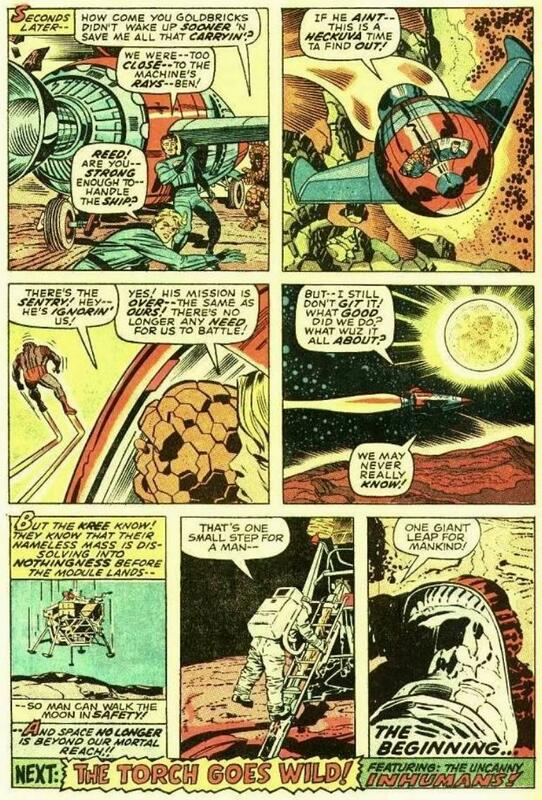 Here are 4 pages from FF # 98, featuring the great moon landing sequence. Posted November 22, 2012 in Uncategorized. Another Giacoia fill-in issue. 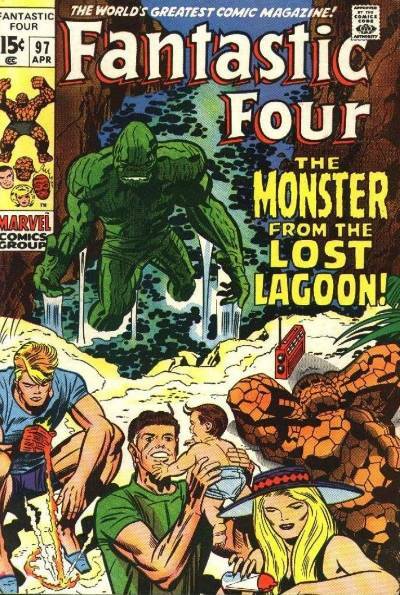 I wonder if readers missed Joe Sinnott on these books in the 60s? I know at 11-years old I did in 1978 reading the reprint. But this is still a fun issue. 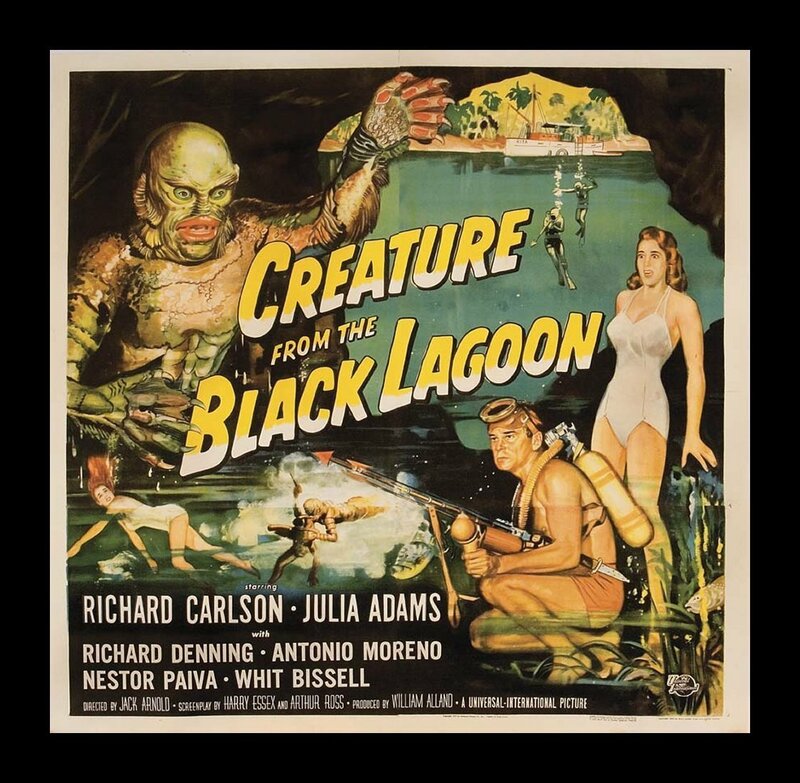 I wonder if Jack had made the decision to move to California at this point and this book reflects him beginning to imagine himself in the land of sun and fun, living out on the west coast where so many classic movies like the Creature from the Black Lagoon (1954) were made?